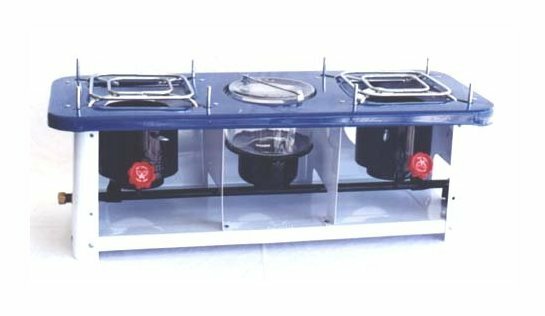 For those living in a safe location, the best kerosene cook stove I have used is the Butterfly #2418 double burner stove. 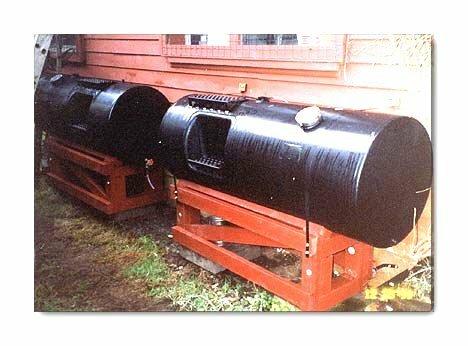 This stove is large, measuring approximately 30 inches long, 12 inches wide and a foot high, and weighs about 14 pounds. This size and weight makes the #2418 extremely stable in use, and the two burners allow meals to be easily cooked. You can even cook on one burner while using the oven over the other burner. This is a saturated wick design stove, which means the fuel is fed to the wick through a valve, and it is the valve which controls the flow of fuel, and therefore the flame height or BTU output. That means this stove is designed to be used on a level counter top, not perched among rocks beside a tent. Yes, you can move the #2418, but it was designed for everyday use in a fixed location rather than as a camping or portable stove. In the Philippines and Indonesia, in fact throughout most of the Far East and Southeast Asia, this is the stove of choice for every day use, if they can afford it. The alternative is to cook with twigs under a grate...rather primitive at best. Notice that the glass fuel tank fits between the burners into a protected hole in the heavy top plate. The "saturated wick" image shows the fixed wick design and the bottom of the catalytic converter: the wick does not raise or lower to adjust the flame height as is the case with every other wick stove or heater I have ever seen. With gravity flow or "wickless" stoves, fuel flow or volume determines the amount of heat output, and that is controlled by minor turning of the red handle. To use the Butterfly #2418, the fuel tank is filled, then inverted and lowered by the wire handle into a receptacle. The fuel tank cap has a protruding pin held open by a spring, and when the tank is in position, the pin is pushed up and fuel can flow into the tube assembly via gravity. Opening the red valve under the burner allows fuel to flow to the wick, which then becomes saturated with fuel in about a minute or two. The catalytic converter unit is then raised and the wick touched with a match, and the top edge of the wick burns the fuel. At first the flame is a bit high, a result of the catalytic converter unit not being up to operating temperature and the saturated nature of the wick. Controlling the height of the flame is done by closing the valve, then opening it up about 1/8th of a turn. Only slight turning of the red knob is necessary to adjust the heat output, but remember that there is already fuel in the wick, so adjustments usually take about 20 to 30 seconds to become effective. Moral of the story: be patient when adjusting the flame height, and you will soon become accustomed to its operation. You will be rewarded with totally silent operation, even and steady heat, and absolutely reliable operation. To turn off the Butterfly #2418 pressure stove, simply turn off the flow of fuel by gently turning the red knob to the right until it stops. There is no need to twist hard on the red knob and try to damage the needle valve at its bottom. The fuel flow will be stopped by gently turning the valve closed, and in a minute or so the residual fuel will be consumed and the stove will go out. The fuel reservoir on the Butterfly #2418 Pressure Stove holds 1.85 quarts, and burn time is approximately 12.5 hours per burner. Using both burners reduces the refill time to approximately 6 hours, which is more than adequate for 3 or 4 days of use even when using the oven to bake bread, for example. A gallon of kerosene should be sufficient for a week of cooking and baking normal, regular "made from scratch" meals. The wick for the Butterfly #2418 is approximately 10 �" by 7/8". This special wick fits down into a thin slot and the top edge only is what supports the flame: the wick itself does not burn, of course. How long will a wick last? In Asia, many users report that wicks can last up to a decade, but they are experienced users. I can guarantee you that your first wick won�t last that long...figure 6 months of every day use for the first wick. After you gain expertise, wicks will last longer. The trick is to never light the wick before it has become saturated with fuel, and when the stove is turned off, to let the flame die out on its own. Once one "side" of a wick has become ragged after long use, turn it upside down and start all over with a new burning edge! The Butterfly #2418 dual burner stove comes unassembled. All you need for assembly is a flat bladed screwdriver and a 9 mm socket or wrench, or a small crescent wrench. The back and bottom are one piece. Begin by first placing the long tube with fittings for the wicks and tanks (part #808A) on the bottom, with the brackets over the ends, line up the holes, then fasten finger tight only: the unit will be aligned and tightened once assembly is complete. Assembly can easily take 3 hours, so be patient. Next affix the end pieces: notice they are notched at the bottom. The top plate (part #1002a) is attached next, and when it is tightened up the unit becomes square and straight. 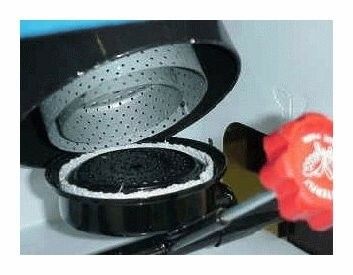 Then fit the two flat support braces inside the stove: see the illustration above. The screw flanges are placed facing inward toward the tank, and the narrowest part of the cutout for the tube assembly is placed toward the front (there is a raised section of the base to guide you in this operation � just match up the width of the flange with the base). Now it is time to assemble the tank. Very carefully bend the top of the wire loops inward, then spring the wire handle loops through the holes in the band projection. Work slowly and carefully � don�t break the glass. Now put the fuel tank (part #101) down through the center hole in the top plate until it mates with the receptacle. It won�t fit evenly, which is why you left the bracket screws loose. Move the bracket forward or backward until the glass reservoir fits squarely on its base and is centered in the access hole on the top plate of the stove, then tighten the two bolts and nuts on each side of part #808A, and tighten all nuts and bolts on the stove. Next put the red knobbed fuel flow needle valves (part #707) into their tubes, and tighten very gently. Finally, put the wicks on edge (part #606) into their slots, with the slight opening toward the front (see illustration above), making sure the wicks are seated uniformily at the bottom of their slots. Lower the catalytic converter (part #505) down over the wicks and wiggle until it is centered, then put the cooking bracket (part #303) on the top plate (match up the 4 holes in the top plate), and you are ready to put fuel into the tank and use the stove! IMPORTANT: Open the fuel control valve and let the wick become fully saturated before lighting - every time!Just opening the valve for a couple of minutes before use should extend your wick life by a factor of years.